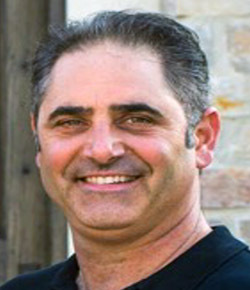 In addition to being a director on the San Luis Canal Company (SLCC) board, Michael Palazzo serves as a Director on the Henry Miller Reclamation District Board. He represents SLCC as a member of the San Joaquin River Exchange Contractors Legislative Committee. Michael is also a director of Los Banos Sportsmen’s Association. and a member of the Alpha Gamma Rho Fraternity. Mr. Palazzo was born and raised in Los Banos, California, and is a third-generation farmer, actively farming for the last three decades. He follows in his family’s footsteps, and now currently runs his farming business known as Palazzo Farming, Inc. On his ranch of 1805 acres located within the SLCC service area, Mr. Palazzo grows alfalfa, cotton, processing tomatoes, melons, wine grapes, and wheat. Michael and his wife Nicole of 20 years, have two children. Their daughter Lia who is 18 years old and their daughter Gianna is 16 years old.